Inside a large white structure set back behind the brewery is a land-based aquaculture system. 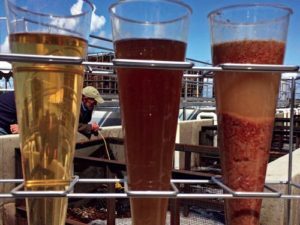 It’s the life’s work of Jere Northrop, founder of TimberFish Technologies.Stillage — a byproduct of brewing — flows from a pipe into a steel bin. It’s the color and texture of watery, chunky peanut butter. February 23, 2018 in Feed, News, Research.